Medicine and Technology: When will medical students be using electronic text books? When will medical students be using electronic text books? I was at the coffee shop the other day and I saw someone reading an e-book. This person was using the Amazon Kindle, a $360 gadget. Sony has updated its digital book and now offers a model that has a touch screen. 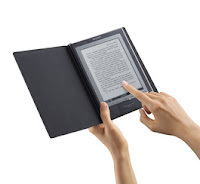 These e-books are becoming so popular for people who wish to read novels. How about for medical students? When will electronic textbooks become the 'norm' in medical schools? I think the Tablet PC offers an excellent way to read/study and leverage multimedia resources. So, will those huge textbooks ever get replaced? I still have my Netter Atlas CD-ROM.